Docs.com offers Microsoft’s online versions of Word, Excel and PowerPoint. The system is available to anyone with a Facebook account: while that’s a controversial decision, it will allow you to share documents and collaborate with friends and colleagues. The applications are beta products. Needless to say, don’t use them for any critical work or, if you do, download copies of any documents you create. Opera regularly freezes and Excel fails to load. Overall, Chrome appears to offer the best experience. I doubt that will please Microsoft! The Office ribbon makes an appearance in all three applications and Office 2007/2010 users will immediately feel at home. I’m not a huge fan of the ribbon. However, that’s primarily because I used Office from the first version and became familiar with the clunky old menu system. That said, the ribbon is easier for new Office users. I’ve become familiar with it, but still find myself hunting for options now and again. I’m not convinced the online versions need the ribbon. Word offers the most options, but several of the sections are sparsely populated. I’m sure the ribbon will become more useful as the applications evolve and receive more features. Word is the most sophisticated application yet it remains less powerful than Windows WordPad. The standard formatting and spelling options are available, although it won’t spell check as you type. Tables, images, MS clipart and hyperlinks can be added, but don’t expect a range of options, i.e. it’s not possible to add borders to tables. There’s a standard editing view and a reading view. Strangely, Word randomly starts in reading view so you can’t immediately edit the document. The switch to editing view is only a click away, but it slows down the user experience. What I found most bizarre is the “Save” icon. Web applications generally save data as it’s entered but, if you don’t hit save, you’ll be presented with an irritating “Are you sure you want to navigate away from this page” dialog. Perhaps it’s less confusing for existing Word users, but the save icon doesn’t appear in Excel or PowerPoint? Excel is basic although I found it to be the fastest application. You can enter and format data, but there are no advanced features such as charting. You also have very little control over data types — for example, US formats are always used for currencies and dates. Formulas are tricky to enter. 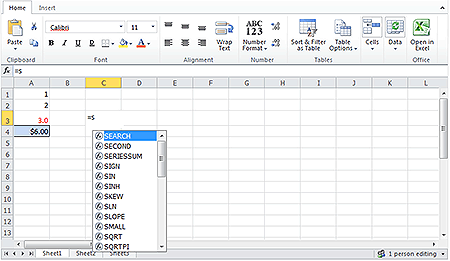 The application supports a wide range of formulas and a long drop-down list appears when you type ‘=’ and a letter. But then you’re on your own — Excel won’t tell you what a formula does or what arguments it requires. 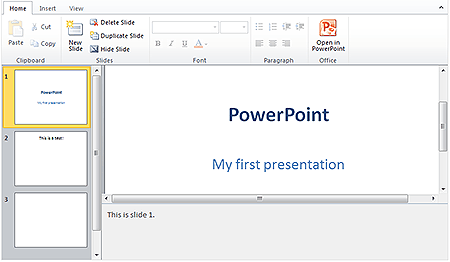 PowerPoint is the most under-developed application in the suite. Slides can be added, removed or edited, but the facilities are limited. You can’t change the background color, add content blocks, or rearrange boxes. Graphics can be added with “Smart Art”. In effect, this converts a hierarchical list of text items into an organization chart, table, or another diagram. It’s quite clever, but I suspect it’ll confuse many people. 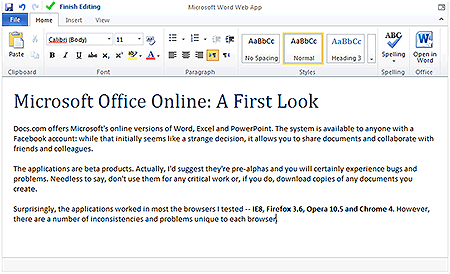 Microsoft Office Online is a beta although it feels more like a pre-alpha. You will certainly experience inconsistencies, bugs and problems no matter which browser you use. There’s no help, it’s slow, and hangs on an alarmingly frequent basis. The suite will undoubtedly improve, but I couldn’t recommend it for everyday usage at this stage. If you want to try online office software, use Google Docs or Zoho instead: they are far superior and also support MS Office-compatible documents. Have you tried Office Online at Docs.com? What did you think?